In this segment, Bill and I will be discussing how current events in the Middle East have set the stage for some major prophetic battles to happen soon. Bill Salus: We are living now in some very interesting times. I suspect there is well near 100 pages in your normal pew Bible filled with prophetic content that has not yet found its final fulfillment. Obviously the Rapture, but we are also talking about some Israeli war prophecies such as the destruction of Damascus in Isaiah 17. The Israeli war prophecies of Psalm 83 and Ezekiel 38-39 are two distinctly different war prophecies in my estimation. Is it in your estimation as well? Bill Salus: In talking about these Seal, Trumpet and Bowl judgments that come in Revelation, there could be a whole flurry of wars that occur during a gap between the Rapture of the Church and the commencement of the Tribulation period. Certain types of events could fit very well in there and will be very powerful. Let's talk about the destruction of Damascus in particular. Presently, Damascus has 4 1/2 million Syrians either in Damascus or in connected metropolitan areas living there. It says in Isaiah 17:1, "Damascus will no longer be a city but will become a heap of ruins." It seems to be in verse 9 and 14 of Isaiah 17 that Israel may be responsible for that, if we understand that interpretation right. Nathan Jones: When you read Jeremiah 49 as well, it makes it sound like not only will it become a ruinous heap, but that such destruction will happen in just one day. Now, how does Israel destroy the oldest city in the world in under one day? I think what we are talking about here is some sort of nuclear disaster. Bill Salus: It might. Israel could utilize the scalar technology that came out that can create a nuclear blast with the whole mushroom effect but without the damaging radiation. So, the technologies that exist today make Hiroshima look like the days of Adam and Eve in comparison. Bill Salus: We are talking about events that could happen in the very near future. Iran is developing a nuclear weapon and they say they want to wipe Israel off the map. On December 3rd, Iranian President Ahmadinejad said that, "There is nothing..." (I am going to say it nicely) "There isn't a darn thing..." (he didn't use that word) "That Israel can do to stop Iran from getting a nuclear weapon." Doesn't that sound like Iran wants a nuclear weapon rather than using nuclear energy for civil defense purposes? Nathan Jones: For people who get their gas at like 14 cents a gallon, what do they need atomic energy for? Their claim that they are developing nuclear energy for peaceful purposes is a total transparent sham, especially when every other word that comes out of Ahmadinejad mouth is "death to Israel," or "wipe them off the map." Reports say Iran now has enough nuclear fissionable material to make two atomic — not nuclear — but atomic bombs, which are still enough to wipe out a city. Iran continually thumbs their nose at the International Atomic Commission saying, "We are not going to listen to you. We are going to pull out and do our own thing." They bent Russia's arm behind their back and said, "You will finish that nuclear reactor." Even though Russia voted against Iran's nuclear energy ambitions, they are the very ones building their nuclear reactors! Iran is hell bent (and I use the phrase literally) — hell bent in going nuclear with their intention. We can see the beginnings of war even now as Iran is funneling resources into Gaza and into Syria and Hezbollah. Iran definitely has a death wish against Israel. That Iran's nuclear energy is going to be used for peaceful purposes is pure nonsense. I don't think anyone in the world really believes that it will be used for peace. 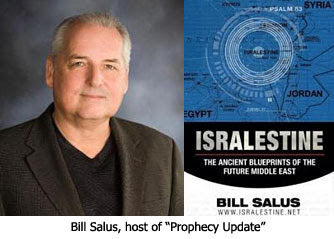 Bill Salus: Next, on December 4th, the day after Ahmadinejad said that Israel cannot do anything to stop them, Iran successfully simulated a detonation. The detonation component is very hard to achieve. It is very challenging to simulate a nuclear detonation through a laboratory environment and computerize model. It means they don't have to do what North Korea did and blow something up underground. Iran did it successfully. The experts are saying it is very challenging to achieve this and it means that Iran could be within one year now of having a nuclear weapon. If they've got the ability to detonate then they are closer than many people think. Nathan Jones: Iran has a missile that reaches 1,000 miles. They have no problem delivering a nuclear weapon all the way to Jerusalem or Tel Aviv. So, Israel has really got their backs up against the wall. Nathan Jones: Another interesting political event with prophetic significance happened last November when Turkey suddenly dropped diplomatic relationships with Israel. For 20 years Turkey has had strong diplomatic relations with Israel. Turkey first dropped out of an military exercise with Israel and the United States and switched to participating in a joint military exercise with Syria. Turkey then formed a pact with Syria and now they can have diplomatic immunity and open borders. Turkey, which has basically been shunned by the EU, is looking East. What we're seeing today is in exact fulfillment that Turkey would become a part of the Ezekiel 38-39 coalition of nations that will some day soon attack Israel. Turkey has now prophetically moved into that scenario. And so, we have seen a lot of prophetic pieces lately starting to come together in the Middle East. so exactly how fast would you say prophetic events are moving? Like everything else, it's relative from the position of the viewer. In foresight it's like tomorrow, and in hindsight, it's like yesterday's news. It's coming, but it ain't here yet. Actually, all that joking aside, I believe Bible prophecy is being fulfilled right here and now. We are living in "The Generation" so it's all around us 24/7/365. I was listening to a message last night on the ‘Blue Letter Bible’ site. It was on Daniel 8:15-27 by Jack Stevens. He explained how the old Empires of Egypt, Assyria, Babylon, Medio-Persia and Greece, although reduced in power, are now returning to prominence and are causing Israel grief again, as well as the revived Roman Empire through the E.U. Each Empire was ‘eaten up’ by each conquering Empire and each had the national traits of those that were ‘devoured’ by their conquest. This morning I awoke with the idea of ‘Russian dolls’ nagging at me. We see one doll, yet inside are more dolls in ever decreasing sizes. We look at the Roman Empire and hidden within are the former Empires and their own idiosyncrasies evident in the main ‘doll’. With the re-emergence of Rome, it’s like the ‘Russian dolls’ being separated out, as Iran that was Persia, Iraq that was Babylon and so on. The very nations that conquered Israel are back on the map once again threatening God’s own land. I hadn’t seen this before and it really quickened me to realise how fast events are unfolding. Maranatha! Whenever it is, I'm sure YOU would agree it can't be soon enough! a big hearty AMEN to that Billy!